The program is called B.u.G.! First, I bought small pictures of insects and frogs – they are usually near the calendar numbers at the teacher supply store. I punched a hole at the top of them. On a bulletin board I put each child’s name with a pushpin beside their name. When I caught him/her showing B.U.G. 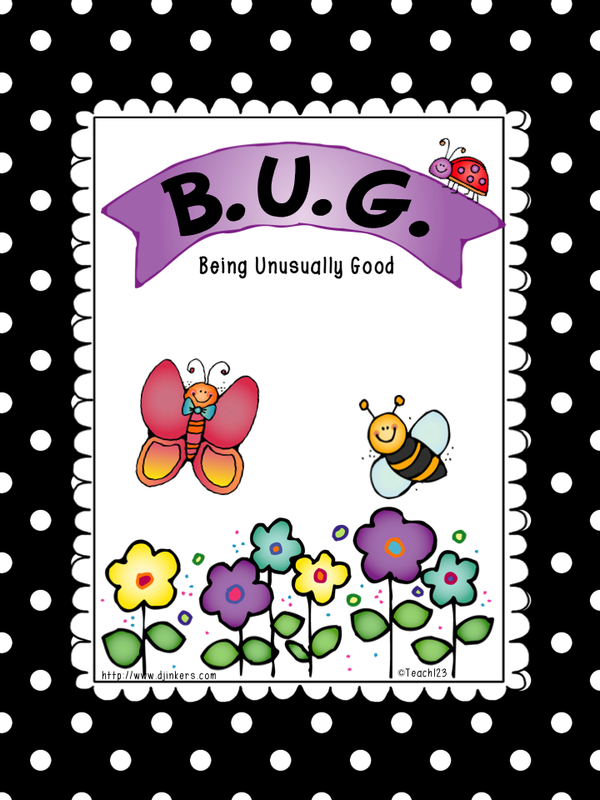 (Being Unusually Good) behavior they earned a bug. The students could not tell me they were being “buggy”. I had to “catch” them. After so many bugs they earned a prize. Prizes could be anything – write one assignment with special gel pens, use my glitter crayons on one assignment, eat snack beside a friend, etc. Notice: prizes do not cost much after you buy special school supplies. Usually parents will donate these if you ask. If they do something REALLY, REALLY bad (physical aggressive, lying, stealing) they get a frog. What do frogs do? They eat bugs!!!! If a student gets a frog, they lose ALL of the bugs they earned. It a very sad day when that happens which is why they try to be buggy! One of the points of positive reinforcements/reward system is to not take away an award once it has been earned. It can be disencouraging. Not earning the reward is the consequence. I like the bug idea, but not the frog.